The PELCO® Modular SEM Specimen Holder System offers the most comprehensive and cost effective range of specimen holders available today with full interchangeability between SEM models or brands. If you are using different models of SEMs in one location or your new SEM comes from a different manufacturer, you can continue to use the PELCO® Modular SEM Specimen Holders by adding just the appropriate SEM stage adapter. The PELCO® SEM Specimen Holders offer capabilities not available from SEM manufacturers or specimen holders supplied with the SEM. New specimen holders are added on a regular basis. The PELCO® Modular SEM Specimen Holder System consists of a selection of stage adapters for most commercially available SEMs, an extensive range of interchangeable SEM Specimen Holders and adapter buttons for some of the SEM stage adapters. 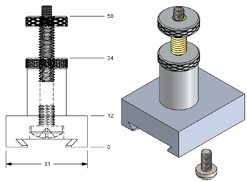 All Stage Adapters use either an M4 screw (supplied) or M4 thread to attach the SEM specimen holders. All SEM specimen holders have M4 thread in the bottom of the holders. The Modular SEM Specimen Holders will fit directly on the Hitachi style stage with M4 thread. Only the Dovetail style Stage Adapters for JEOL and Zeiss/LEO need either a Short Button or an Extended Button to attach the Modular SEM Specimen Holder to the Stage Adapter. (15371 or 15397) with M4 Threaded Mount Specimen Holder. Below are examples of how to connect the Stage Adapters to the Modular SEM specimen holders. Hitachi T-Base Stage adapter 15370 uses an M4 screw to attach the Modular SEM specimen holders. No additional adapter is needed. New style Hitachi T-base stage adapter 15370-1 uses an M4 screw to attach the Modular SEM specimen holders. No additional adapter is needed. New Style T-Base Adapter 15370-1 with M4 Screw and 15375-2 Single Flat Sample Clip Holder. New Style T-Base Adapter with M4 Screw Single Flat Sample Clip Holder, assembled. FEI/Philips stage adapters 15368 and 15368-2 have an M4 thread and fit directly into any of the Modular SEM specimen holders. No additional adapters needed. Base, Pillar and Locking Nuts may also be ordered separately. shown with SEM Specimen Holders Attached. 15378-2 Cross Section Holder, 90 degrees and Dovetail Stage Adapter 15371, assembled. 15305 Multi Purpose Specimen Holder and Dovetail Stage Adapter 15371, assembled. Extended Button 15372-10 with M4 Screw used to attach 15320 Straight Bulk Specimen Holder to Dovetail Stage Adapter 15371-67A. 15320 Straight Bulk Specimen Holder and Dovetail Stage Adapter 15371-67A, assembled. ZEISS/LEO Dovetail Stage Adapter 15397 needs either the Short Button or the Extended Button. The Short Button is for the smaller Modular SEM Specimen Holders to reduce the height. The Extended Button is needed for the larger Modular SEM Specimen Holders. Short Button 15372 with M4 Screw used to attach 15375 Single Flat Sample Clip Holder to Dovetail Stage Adapter 15397. 15375-2 Single Flat Sample Clip Holder and Dovetail Stage Adapter 15397, assembled. Extended Button 15372-10 with M4 Screw used to attach 15315 Multi Specimen Holder to Dovetail Stage Adapter 15397. 15315 Multi Specimen Holder and Dovetail Stage Adapter 15397, assembled. Stage Adapters: AMRAY 15367-10; ISI/ABT/Topcon 15367-20; CamScan or Tescan 15367-30; and the Pin Stub Adapter 15319 all have M4 thread and fit directly in any of the Modular SEM specimen holders. 15367-10 Stage Adapter with 15320 Straight Bulk Specimen Holder. 15367-10 Stage Adapter and 15320 Straight Bulk Specimen Holder, assembled. The Stub Extensions: Short 15372-2, Medium 15365-2 and Long 15374-2 can be used to extend the height of an SEM specimen mount or an SEM specimen holder on the T-Base or the Dovetail type Stage Adapters only. 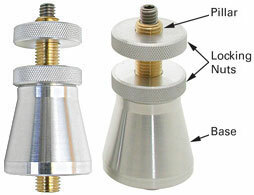 The locking nut ensures additional stability. Specimen exchange T-base adapter incorporates an aluminum body and self-aligning double sided brass thread block to facilitate smooth insertion on the SEM stage and to prevent binding. Can be used with any of the Modular SEM Specimen Holders if the SEM stage travel permits this. Includes M4 screw. Made of vacuum grade aluminum with counterpart for airlock manipulator and locking rod. Can be used with any of the Modular SEM Specimen Holders if the SEM stage travel permits this. Includes M4 screw. Made of vacuum grade aluminum to fit on the Hitachi S-3400N SEM. Can be used with any of the Modular SEM Specimen Holders if the SEM stage travel permits this. Includes M4 screw. Made of vacuum grade aluminum to fit on the Hitachi SU-3500 and SU-5000 SEM. Use the stub extensions (15372-2, 15365-2 or 15374-2) to increase height. Can be used with any of the Modular SEM Specimen Holders if the SEM stage travel permits this. Made of vacuum grade aluminum to fit on the Hitachi S-3700N SEM. Can be used with any of the Modular SEM Specimen Holders if the SEM stage travel permits this. Includes M4 screw. This Hitachi stage adapter for the S2000/S3000/S3500 series consists of a round base (Ø15x18mm), 25mm brass pillar and locking ring. The base and locking nut are made of vacuum grade aluminum, the brass pillar has standard M6 thread with an M4 thread on top which is compatible with the Hitachi specimen mounts and specimen holders with an M4 threaded hole. Can be used with any of the Modular SEM Specimen Holders if the SEM stage travel permits this. Made of brass pillar and aluminum base and locking nuts. This particular material choice prevents "binding" of parts in the SEM stage. Available in standard version with standard pillar, base and two locking nuts and short version with short pillar and two locking nuts. Pillar with M6-fine thread and M4 thread on top. Can be used with any of the of the Modular SEM Specimen Holders if the SEM stage travel permits this. 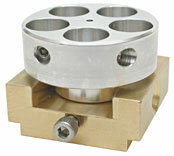 Solid brass Dovetail Stage Adapter can be used on many JEOL SEMs and is compatible with the airlock used on JEOL SEMs. The 14mm hole in the center is compatible with other JEOL holders. 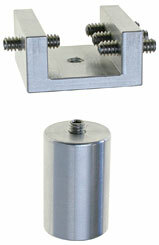 Two Button style adapters are available to connect the Modular SEM specimen holders. The Short Button (15372) is used for the smaller specimen holders only, whereas the Extended Button ( 15372-10) can be used with all Modular SEM Specimen Holders if the SEM stage travel permits this. 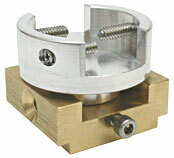 Solid brass Dovetail Stage Adapter can be used on the JEOL FESEMs listed above. Can be used with any of the Modular SEM Specimen Holders if the SEM stage travel permits this. Includes M4 screw. 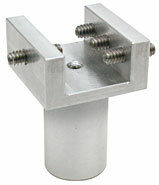 Aluminum Dovetail Stage Adapter compatible with the JEOL SEMs listed above. Can be used with any of the Modular SEM Specimen Holders if the SEM stage travel permits this. Includes M4 screw. Made of aluminum in 3 sizes, Ø9.5 x 10mm, Ø12.2 x 10mm, Ø15 x 10mm with M4. Used directly on JEOL holders. Can be used with any of the modular SEM specimen holders. The solid brass dovetail for the ZEISS/LEO SEMs is fully compatible with the ZEISS/LEO dovetail used on the stage or stage height adapters. 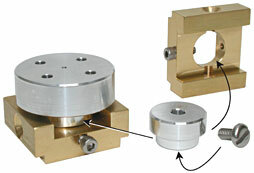 Two button style adapters are available to connect the Modular SEM Specimen Holders. The Short Button (15372) is used for the smaller specimen holders only, whereas the Extended Button (15372-10) can be used with all Modular SEM Specimen Holders. Made of aluminum, 16mm dia x 25mm H with M4 screw. Can be used with any of the Modular SEM Specimen Holders. Made of aluminum, 15mm dia x 10mm H with M4 screw. Can also be used on JEOL stage adapters or specimen holders which accommodate the 15mm cylinder stub. Can be used with any of the Modular SEM Specimen Holders. Made of aluminum, 12.5mm dia x 20mm H with M4 screw. Used with the 12.7mm stage adapter found on the larger stages. Can be used with any of the Modular SEM Specimen Holders. Standard low profile, short and long pin with M4 threads to convert any of the Modular SEM Specimen Holders into a pin stub type holder. Can be used on Cambridge, Leica, CamScan, Tescan, and FEI/Philips SEMs. Short pin for Zeiss/LEO SEMs, long pin for AMRAY SEMs. This arrangement will add height to the total assembly and is not recommended for larger specimen holders or heavy specimens. Hitachi Stub Extensions with M4 thread (top and bottom) are intended toaccomodate shorter working distance in the SEM. Available in 12, 18, 25mm. Stub extensions can be stacked. 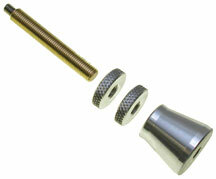 Material: brass with stainless steel M4, complete with aluminum locking nut. Aluminum stage plate with two adjustable height pillars and locking nut. Includes height guage. Can be used with all modular SEM holders with 35 x 35mm x-y movement that do not exceed total assembly height of 50mm.